Nineteen-year-old Rashann Petty reacts during his team's Week 11 win. Walking through the Sixers offices in Camden earlier this month, it became apparent that one section wasn't like the rest. Not far from the organization's promotions and public relations teams, nestled in the corner, was a different sort of team, one that stood out more and more as I approached. It was loud and boisterous, especially for 10 a.m. The group of guys working there had larger monitors — and more of them — and were sitting in different, much nicer chairs than those seated elsewhere. They donned sweatpants and basketball shorts while the others wore more traditional office attire. Not to mention, a few of them looked far too young to be working a corporate nine-to-five job ... probably because they were too young. 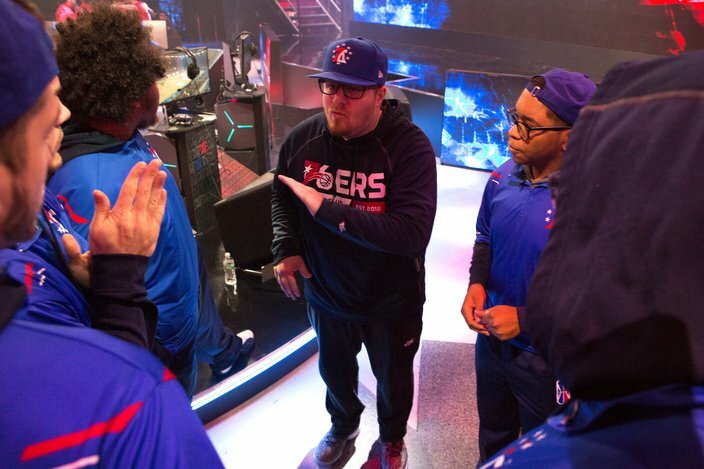 Some of that was to be expected — after all, this is the 76ers Gaming Club, a group of professional gamers taking part in the NBA's inaugural 2K League. And considering they were just coming off a playoff-berth-clinching, triple-overtime win over Grizz Gaming (Memphis Grizzlies), a game unlike anything else in the league throughout the entire season, the noise level was understandably loud. But, huddled around a single computer with coach Jeff Terrell, the six members of the team were doing something somewhat unexpected. They were watching game tape — not highlights of their win, but the full tape — breaking down their successes and pointing out their mistakes. First, however, there was to be a team meeting. Terrell assembled his crew, and the introductions began. 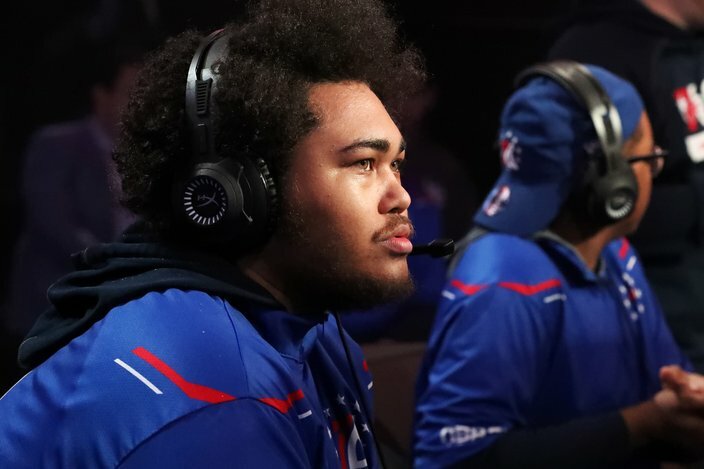 Despite being the coach, Terrell is relatively new to esports, and may not have found himself in the 2K League if not for a life-changing car accident in 2015. "I was playing college basketball and I got in a car wreck and I was on bed-rest for about eight months," Terrell explained. "I started playing from then — that was the first time I picked up [NBA] 2K, just because I was missing basketball." And his experience as a college basketball player — and later as a high school coach — made him the perfect candidate for the job. "Honestly, I was coaching high school basketball and had a lot of success coaching in high school. And then Brendan Donohue, the MD [managing director] of the league used to come into my streams quite a bit, so he referred me to a bunch of teams. I liked Philly the best, so I ended up coming to Philly." Coach Jeff Terrell talks to his team prior to a game. Gathered around Terrell was MVP candidate Ethan White, a.k.a. "Radiant," the team's 19-year-old point guard and first-round draft pick. Then there was 24-year-old Orange County native Alex Bernstein, a former Division II football player who goes by "Steez" and plays center. There's the team's other two teenagers, power forward Mihad "IFEAST" Feratovic, a sophomore philosophy major at Brooklyn College, and guard Rashann "ZDS" Petty, both 19, as well as 23-year-old guard/forward Antonio "Newdini" Newman. Finally, there's Tilton Curry, who, at 27, is the elder statesman of the group — his handle may be "xTFr3sHxX," but his teammates affectionately refer to him as "the old-head." While players like Radiant, ZDS and IFEAST are barely of voting age, Curry's old enough to have some prior job experience, and knows how lucky he is to be able to play video games for a living. "I've done a lot of hard labor in my life," said Curry, who won the league's first-ever sportsmanship award. "I did landscaping, construction, painting, interior and exterior. I've worked in warehouses. I've got my CDL commercial truck driver's license. I've pretty much done it all. I'm a hustler, but this definitely beats everything." His teammates quickly chimed in to agree. For the players, this is a dream job. Contracts run six months and pay $32,000 (and $35,000 for first-round picks), plus a significant amount of potential bonus money can be earned during in-season tournaments, the first of which was won by Philadelphia — and the trophy proudly sits on display in their corner of the Sixers' offices. The pool money for the three in-season tournaments (and the playoffs) totaled $1 million, so it was hardly a tiny sum. Players can also make money through outside endorsements, and receive health insurance and a retirement package, as well as money for housing and relocating to a new city. Currently, the 2K League is working on finalizing plans for how teams could possibly tag certain players and carry them over to the next season, but for most players, they could find themselves playing elsewhere next season — or out of the league entirely. "It's exactly the same as traditional basketball. It's just a video game." In other words, there isn't a ton of job security, but that doesn't mean one year in the 2K League wasn't enough to convince most of their parents that this was a viable career option. "When I was growing up, it was always, 'You're playing video games too damn much,'" Curry said. "This was kind of the same, but now that I'm actually in it, they've been pretty supportive about it. It's pretty cool. Like, live your dreams." Others were less skeptical, like the parents of Washington, Illinois native and former pharmacy student Antonio Newman. "My whole family was supportive," Newman said. "My mom used to get mad at me and tell me to go outside, and I was like, 'At least I'm inside and not outside where you don't know what I'm doing.' After I said that, she let it be and now I'm playing professionally." "My thing was that it was a good release, because I played football my whole life," added Bernstein, who played collegiate football and has a degree in sociology from Northern State University in South Dakota. "So it was a really good release from football. And then, also, my mom and my family were really supportive because they realize that this esports business is really starting to blow up. "A lot of people — I don't think it's going to be this extreme ever — but a lot of people think it's going to take over traditional sports." It may never get to that point, but given the growth of esports in recent years, it's hard to imagine a scenario in which it doesn't at least take a chunk of that landscape back from traditional sports. Eventually. For now, however, it remains on the fringes. But the 2K League seems to be the first steps in a natural progression toward blurring the lines between esports and real sports. And the 76ers Gaming Club is the perfect representation of that. Watching a replay of that triple-overtime win over the Grizz, it was impossible to ignore that what I was watching, at least from one of the teams, looked an awful lot like real basketball. 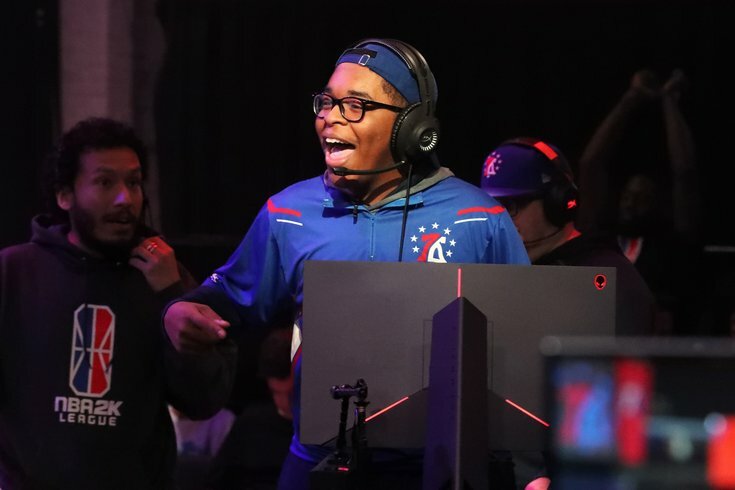 The 76ers Gaming Club doesn't, however, play as the actual Sixers, even though they're point guard Ethan White's favorite team — and Joel Embiid his favorite player. Instead, they play with stock avatars based on league guidelines. Each team consists of standardized players with consistent attributes. All the centers are built the same, all the power forwards are built the same, and so on. Picked in the preseason to finish 14th out of 17 teams, the 76ers GC lost its first-ever game to the Blazers before bouncing back in a big way to win the year's first tournament. And they carried that momentum with them throughout the season, which unfortunately came to an abrupt end last weekend with a loss to HeatCheck Gaming in the semifinals of the 2K League playoffs last weekend. But to call their 10-4 regular-season campaign unsuccessful would be a huge disservice to what this team accomplished. And, more importantly, the way in which they did it. Most of the 2K League coaches don't have collegiate playing experience, but Jeff Terrell does. Not all coaches have actually coaching experience, but Terrell does. And that shows on the court. The 76ers are one of the only teams in the league that runs plays and different offensive sets to get open shots or help provide a spark in late-game situations. By comparison, nearly every other team spreads the floor and lets the best player go one-on-one. "I think it helps a bit," Terrell admitted. "I know more about basketball, I'm sure, than a lot of them... What makes us different is we incorporate plays and stuff like that. I think that sets us apart from other teams. A lot of them play isolation." The contrasting styles were obvious just from watching the replay on the computer monitor beside me. It's how one Grizz player managed to score 84 of his team's 91 points, while each of the 76ers GC players finished in double digits on their way to becoming the first 2K League team (and one of just two all season) to post 100-plus points in a game. "A lot of people don't think that real basketball can convert over to video games, but it really does," Bernstein said while turning to his computer to pull up another example. "[Coach Terrell] has a huge basketball IQ, so he comes up with plays for us and stuff... Just little things that he's brought to the table that help us get an extra bucket or something like that." It certainly paid off this season, as Terrell's team was one win away from advancing to this Saturday's championship game against the Knicks. But this whole gaming thing is much more of a full-time job than you'd think. In addition to games, tournaments and film/scouting sessions on the weekends, the team spent close to eight hours in the office each day throughout the week, going over their plays, scouting their opponents, and scrimmaging, often for more than six hours in a given day. So just how good are these guys? "We have some guys in the office that are pretty good, as amateur players, and then they come play these guys in a scrimmage and we win by 40 to 60 points every time," Terrell said. "And that's because [our guys] are being nice. These guys are the best of the best, and they're here for a reason. There's a huge difference between playing with your buddies at home and playing with these guys." In other words, it's like going from a rec league to the NBA. "It's exactly the same as traditional basketball," Terrell added. "It's just a video game." And if you think that's impossible, then you weren't watching.